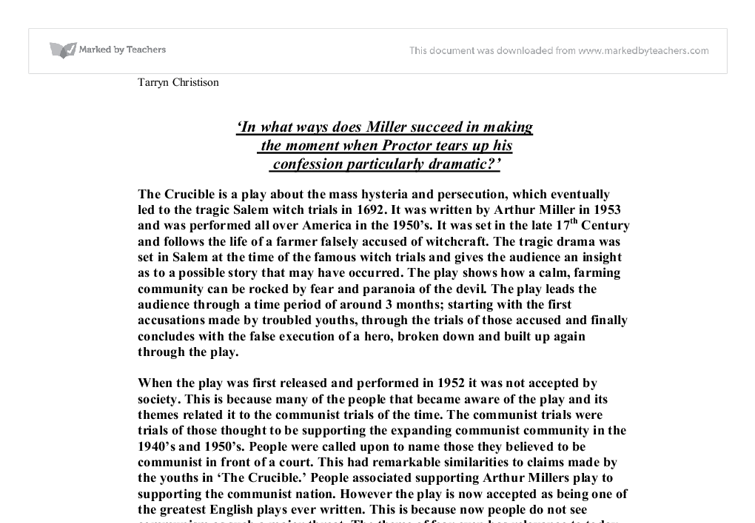 'In what ways does Miller succeed in making the moment when Proctor tears up his confession particularly dramatic?' The Crucible is a play about the mass hysteria and persecution, which eventually led to the tragic Salem witch trials in 1692. It was written by Arthur Miller in 1953 and was performed all over America in the 1950's. It was set in the late 17th Century and follows the life of a farmer falsely accused of witchcraft. The tragic drama was set in Salem at the time of the famous witch trials and gives the audience an insight as to a possible story that may have occurred. The play shows how a calm, farming community can be rocked by fear and paranoia of the devil. The play leads the audience through a time period of around 3 months; starting with the first accusations made by troubled youths, through the trials of those accused and finally concludes with the false execution of a hero, broken down and built up again through the play. When the play was first released and performed in 1952 it was not accepted by society. This is because many of the people that became aware of the play and its themes related it to the communist trials of the time. The communist trials were trials of those thought to be supporting the expanding communist community in the 1940's and 1950's. People were called upon to name those they believed to be communist in front of a court. This had remarkable similarities to claims made by the youths in 'The Crucible.' People associated supporting Arthur Millers play to supporting the communist nation. However the play is now accepted as being one of the greatest English plays ever written. This is because now people do not see communism as such a major threat. The theme of fear even has relevance to today. People of today are scared of the growing power of China, especially the USA. ...read more. The hearing is very biased and the judge seems convinced in his verdict from the beginning giving the impression that the court hearing is simply for show and that it is realistically impossible for the ruling to be in favour of the defendant. This makes the audience worry that Elizabeth will have an unfair trial and she will hang for her 'sins.' We see the first accusation made in the scene quite early on. It is made from Judge Hathorne to Martha Corey (the defendant) 'I am innocent to a witch. I know not what a witch is.' 'How do you know then, that you are not a witch?' Here we see how a witch is prosecuted, this makes us think of fragile Elizabeth and wonder of how she will cope under the strain of court. Here we also see the power used by Hathorne. He uses accusations to make him seem in control and that he holds the power. Proctor and his friend storm into the court and the judge sends them out but then goes to talk to them for disturbing his courtroom. Proctor tries to use Mary Warren's confession to lying to the court to free Elizabeth but soon realises that the only chance of saving his wife's life is to prove that Abigail is lying. The only way he can do this is by proving that she has a reason for wanting Elizabeth dead, to take her place. Proctor confesses to lechery and Danforth says that if Elizabeth will confirm that Abigail and Proctor had an affair he will let all the accused go free. This will prove that Abigail had an evil aim that she was trying to accomplish by accusing women of witchcraft. Elizabeth is brought in and Miller makes this part of the play a semi-climax. There is a lot of tension because the audience are pleading for Elizabeth to claim lechery on John, knowing that it is one of the Ten Commandments. ...read more. Proctor is seen as a hero and martyr at this point in the play. This shows how Miller made the tearing of the confession dramatic. Miller built up tension throughout the play that resulted in the confession being dramatic in some respects exhausting. Miller used clear and lengthy stage directions to show how characters reacted to one another. These stage directions were often very descriptive which means that an actor performing the play could express Millers exact interpretations. This means that the audience could predict (whether they were reading or watching the play) how each character would react to the tearing of the confession. However most characters did not follow their expected routes. For example Parris was in hysteria and though the audience had seen him in panic in Act 1 he was never concerned of Proctor's life and business. At this point he seemed to be the most affected. 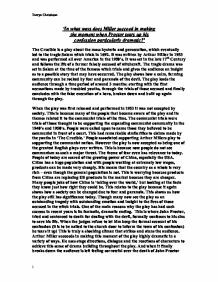 This shows us how Miller used stage directions to create bonds, which would be broken at the tearing of the confession, between the audience and characters. Finally the ending of the play still seems very dramatic even though it was written over 50 years ago. This is because the play was based on fear growing into paranoia in a community. This theme can be related to any time period such as communism in the 1950's. It can even be related into the society of today (possibly with the growing fear of the power in china) which is why I believe that the play is still so popular and why it is still seen as a huge tragedy; people can relate to it. People could relate to it in the 1950's when it was written because of the conflicts with Russia and communism and people can relate to it now with the threat of China's growing power. People in society will always have fears, therefore the play will always have some relevance no matter which time era it is being read / performed in. Tarryn Christison 1 ...read more. Up until John Proctor, the people that were hanged were not respected. If Proctor has confessed, many more respectable people might have been brought to trial as well. The choice he made turned out to be better for the majority. She is evil. She is going to have seventy-two people killed within the next week, if that! People that have never even stepped a foot in her way. Never done anything to hurt anyone. Oh Elizabeth. If only you knew how much I love you, and how sorry I am. Proctor has aroused passion in Abigail Williams, a beautiful young maid. She despises Elizabeth, Proctors wife, and is drawn to Proctor herself. They became lovers and Elizabeth discovered this. The dialogue between Proctor and Abigail highlights the fact that the two have previously had a sexual relationship. Is John Proctor a Good Man in Arthur Miller's Crucible? Act Two of "The Crucible" shows the complexity of John's character and the broken relationship between him and his wife. In this Act Miller presents Proctor as a guilty man who is proud of his reputation. At the beginning of the scene, Miller uses dramatic irony to show us how Proctor tries to please his wife after his affair. This is shown when Mary says "Mr Dnaforth" the girls (including Abagail) say "Mr Danforth". Then Mary says "Never, Never" and then the girls say "Never, Never". They do this as they are pretending Mary is using WitchCraft to control them.